Time Management for Sales People is a critical issue for most sales forces. Managing time as a scarce resource is something that strong sales people do really well. There are so many demands on a sales person’s time from so many different areas. Customers, sales managers, operations people and marketing, to name but a few, will want time with salespeople. Because of this, sales people get pulled in many different directions. Quite often with too little time to do too many things, it can become difficult to tell what we should be doing. So how can you beat this cycle, and deliver great sales results for your company? 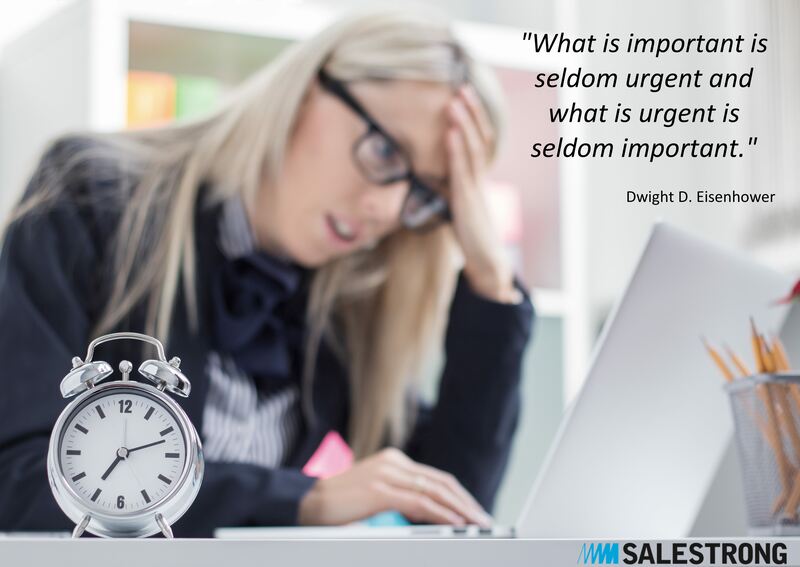 Eisenhower’s Urgent/Important Principle helps sales people to think about their priorities, and determine which activities are important and which add value. This is a tool that is often used in sales coaching. Eisenhower recognised that proficient time management results from being ‘effective’ as well as ‘efficient’. That is to say, we should spend our time on things that are ‘important’ and not just focus on the things that are ‘urgent’. For this to be achieved we need to be able to contrast important with urgent activities. That is a lot easier to say than to do. Important activities have an outcome that leads to us achieving our personal or professional goals. Urgent activities demand our immediate attention, and often have the additional pressure of being linked to someone else’s goals. Because of the pressure from other people, the urgent activities are the ones we tend to focus on. Often the pressure is greater because the consequences of not dealing with them are immediate. Also some people prefer the adrenalin that comes from urgency of late activities, this helps them to focus. So they tell me…. The first step is to ascertain which of the activities are important and which are urgent. If we can do this, there is the potential to sacrifice less important but urgent activities so that we can focus on the more important activities. These more important activities typically add more value to our lives. When this happens we can move from firefighting and being reactive, to being proactive. Using the Eisenhower principal is very easy, all you need is a simple 2 x 2 matrix. 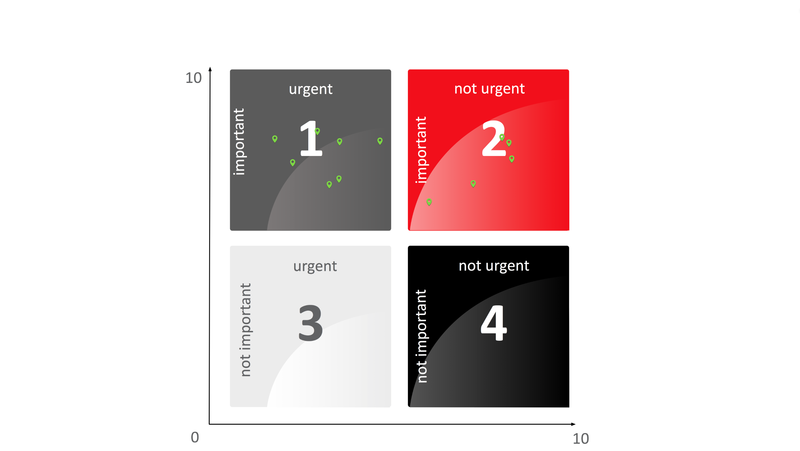 There are two different types of urgent and important activities. There are activities that you could not have anticipated, and others that you knew about but decided to leave to the last minute. You can eliminate last-minute activities by planning ahead of time. Easier said than done because often sales people have the problem that they are so busy they don’t actually have time to be proactive and plan! You can’t always anticipate or avoid crises and disasters in sales. So a good idea is to leave some time in your schedule to handle unexpected issues and unplanned important activities that inevitable crop up. If you have a lot of urgent and important activities, identify which of these you could have foreseen, and think about how you could prioritise such activities ahead of time, so that they don’t then become urgent. You may also want to challenge yourself on whether they really important or not. Do they contribute towards your personal and work goals? This is a matrix taken from one of our sales training sessions. As you can see the delegates put nothing below the line at all, as they perceived everything to be important. We challenged them on this to prioritise their activities, which is always possible. People in our sales training workshops often find this difficult. Perhaps because we are, as author Douglas Rushkoff claims, experiencing ‘present shock.’ This is a condition in which we live in a continuous, always-on ‘now’ and can lose our sense of long-term direction. In such a state, it is easy to lose sight of the distinction between the truly important and the merely urgent. These are the activities that help you to achieve your personal and professional goals. Many sales people spend to much time firefighting in box 1 to spend meaningful time here. Ensure that you have sufficient time to do these activities in a timely fashion, so that they do not become urgent (box 1). As we said before, remember to leave enough time in your schedule to deal with unforeseen issues arising. This will maximize your chances of keeping your head above water, and also help you avoid the stress of your work life encroaching into your private life. We should seek to spend most of our time on Q2 activities, as they’re the ones that provide us lasting happiness, fulfillment, and success. Unfortunately, there are two key challenges that keep us from investing enough time and energy into Q2activities. Firstly people rarely know what’s truly important to them and we all have an inclination to focus on whatever is most pressing at the moment. Doing so is our default position. It’s hard to get motivated to do something when there isn’t a deadline looming over us. Urgent but not important activities prevent you from achieving your perosnal and work goals. Challenge yourself as to whether you can offload them by, for example, delegating them. Most often these types of activities eminate from other people, and this is more so in sales than in many other jobs. It’s especially difficult when it comes to customers, but sometimes it is OK to say “no”. Most often it’s the way you say it! Many sales people spend a lot of their time on Q3 tasks, whilst firmly believing that they are working on Q1. activities. Because Q3 tasks tend to help others out, this can give them the air of important. They’re also usually tangible tasks, the completion of which generates a sense of satisfaction that comes from checking something off your ever growing to do list. But remember while Q3 tasks may be important to others, and tangible, they’re not important to your goals. Such activities are a distraction from meaningful and value creating activities. You should try to ignore or cancel as many of them as you can. Again the major issue for sales people here is customers that are causing this type of activity. Delegate them into the appropriate area of the business or tactfully disengage. If people see that you are clear about your role and your goals, and the natural boundaries that they create, they will often avoid asking you to do not important activities in the future. 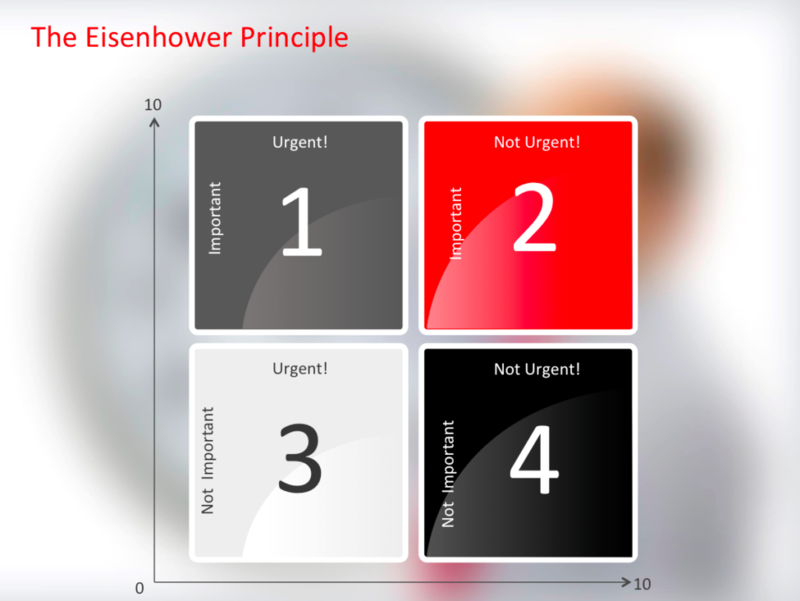 Eisenhower’s Urgent/Important matrix allows sales people to quickly identify the activities that they should focus on, as well as the ones they should disregard. The aim for any sales person is to remove wasteful activities and open up time for more proactive work on important but non urgent activities. This in itself should create more time. Challenge yourself this week is to apply the Eisenhower Principal to your sales activities. When faced with a decision, stop and ask yourself, “Am I doing this task because it’s important or am I doing this task because it’s just urgent?” As you spend more of your valuable time working on non urgent but important tasks, you’ll feel a renewed sense of calm and control in your life. You’ll feel like you’re a Strong sales person. And to keep you on the straight and narrow there’s the Eisenhower App!